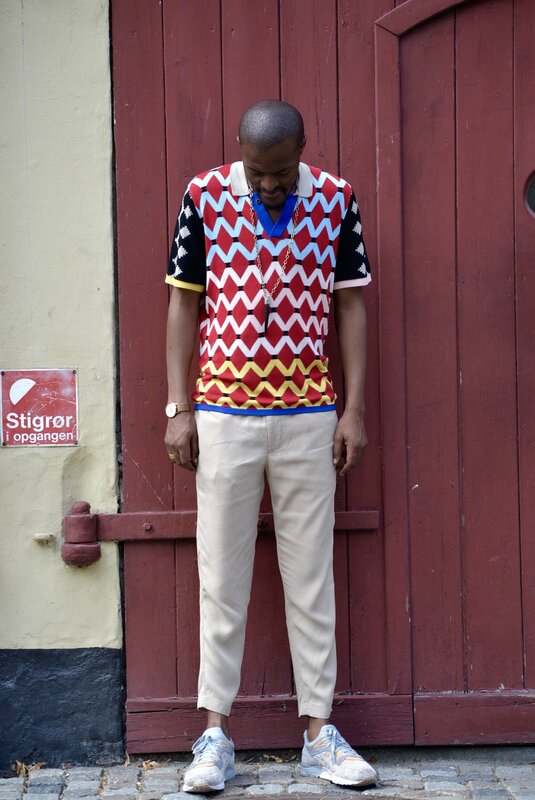 Recently I met Laduma Ngxokolo, the South Africa founder and designer of the Maxhosa brand . Maxhosa is South African knit brand that has been making waves internationally , check @ Maxhosa and follow them immediately. Through the magic of social media, I was fortunate enough to meet- up with Laduma during his visit in Copenhagen for a business meeting. He always knew he wanted to be a designer. His late mother taught him how to weave. 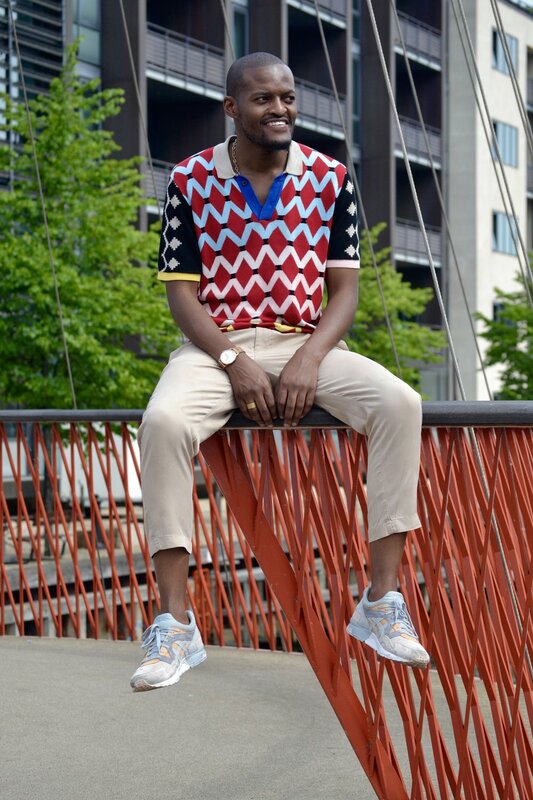 He does mentorship programes in South Africa apart from designing and overseeing the Maxhosa brand. 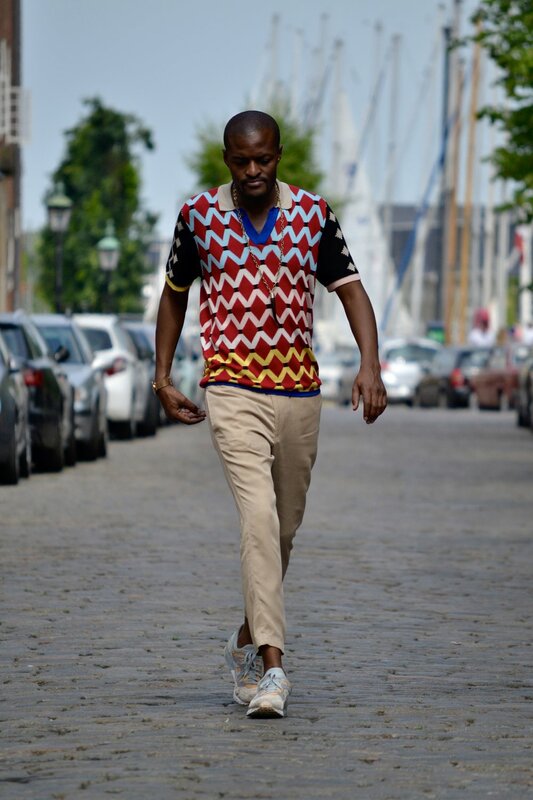 He is working on expanding the Maxhosa brand in the Scandinavia. To those of you unaware, who is Maxhosa? MAXHOSA BY LADUMA knitwear started in 2010 with the desire to explore knitwear design solutions that would be suitable for amakrwala (Xhosa initiates). The vision was to create a modern Xhosa-inspired knitwear collection that would be suitable for amakrwala. It then merged to be developing premium knitwear that celebrates traditional Xhosa aesthetics. It explores astonishing traditional Xhosa beadwork patterns, symbolism and colours, he discovered that they would be the best source of inspiration for the knitwear, which are then reinterpreted into modern knitwear. What sets your designs apart from other designers? The story of the designs have become unique, as well as distinctive signature patterns, the inspiration is what also sets it apart. What do you wish your designs should convey ? a story, heritage? Both, There is huge story that has often been left out, with regards to the designs, each design captures a spirit of the times, both current and with nostalgia. Thus Heritage is key in creating the designs, as each story is unique and needs to be told. Social media has become a huge part of business, as we are in the business of fashion, and fashion is predominantly about showing what you have created. Thus platforms such as social media can break new grounds and introduce you to new businesses. Stick to your own aesthetic, the design industry is not east, but designers must learn to craft their own signatures in all the pieces they create. How is the future for African designers globally? We are in an African renaissance, which implies that the global village has their eyes set on what is happening in Africa, also we as Africans are seeing our powers and are able use our own heritage to build our own narratives. Check @maxhosa on instagram or www.maxhosa.co.za.